Not only do we have the slowest start to tornado season in a century, but tornado damage losses are in decline | Watts Up With That? So far in 2014, the United States has experienced fewer tornadoes than in any year since record-keeping began in 1953, or even before. Greg Carbin, a meteorologist with the Storm Prediction Center of the National Oceanic and Atmospheric Administration, has called this “likely the slowest start to tornado activity in any year in modern record, and possibly nearly a century.” But just because tornado activity has declined doesn’t mean that we can let down our guard, as potentially large impacts are always a threat. Overall, however, the good news for residents of the Midwest’s “Tornado Alley” and elsewhere is that over the past six decades America has witnessed a long-term decrease in both property damage and loss of life. That’s the finding that I and Kevin Simmons and Daniel Sutter, two of the nation’s leading tornado experts, have gleaned from studying the data on almost 58,000 tornadoes observed since 1950. Using estimates collected by the NOAA’s Storm Prediction Center, we used several approaches, including taking inflation into account, to “normalize” historical losses to 2014 dollar values in order to estimate how much damage would occur if tornadoes of the past occurred with today’s levels of population and development. 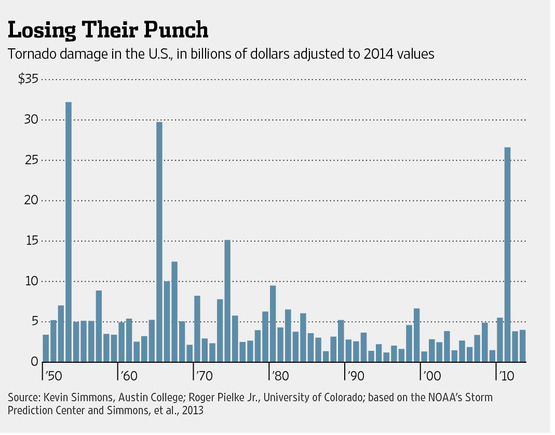 The average annual U.S. property losses caused by tornadoes, from 1950 to 2013, is $5.9 billion in today’s dollars. However, for the first half of the data set (1950-81), the annual average loss was $7.6 billion, and in the second half (1982-2013), it was $4.1 billion—a drop of almost 50%. “There is low confidence in observed trends in small spatial-scale phenomena such as tornadoes and hail.”……. OMG It’s worse than we thought! The tornadoes are hiding in the deep oceans with the missing heat! Just wait, Tornadoes, heat, the El Nino Leviathan, all poised to rise from the depths! And Godzilla is coming out in theatres soon too! Damage seems a little fuzzy to ‘model’ to me, depending on how you adjust for inflation, property values, growing population, etc. But it’s not too surprising considering the undeniable lack of increase in tornadoes themselves. What’s really remarkable about 2014 is the ‘tornado drought’ is breaking records even before you adjust for increased population and better tracking technology. I dislike using amount of losses as a measurement whether its by the alarmists or the skeptics. There’s far too much room to play with the numbers, their accuracy is questionable and what we really care about is the number/power of the storms themselves. So let’s not play this game. On the other hand, I would buy a ticket to a Congressional hearing that required testimony from the executives of the big insurance companies who are backing climate change so as to justify rate increases. Well I’m sure the damage cost has gone down, because we have had so much destructive climate damage due to global warming, that you can’t buy hazard insurance any more from insurance companies; only FEMA, so the value of properties has plummeted, which means the results of catastrophic climate damage aren’t worth as much any more. It even made news on the weather network. Question: What happens when the polar cold air mass/polar jet intrudes on the median jet? A slow start should have been expected..
Conspicuously missing from that Top 5 list is the lack of warming for 13? 15? 16? years? I don’t understand how better tracking technology could save much money, (excepting living in an RV so you could drive your house away from the path of a tornado..), but your point on the population factor certainly deserves repeating. If every year had the SAME number of tornadoes of same strength occurring over the same general areas – the chart would resemble the adjusted county tax revenues on structures for that general area. Doubling the number houses should result in double the number of houses flattened by tornadoes. Building designs/practices have changed somewhat but not enough to explain the drought IMO either. Ok so AGW is not causing more extreme weather. It’s certainly causing more extreme worry. 17 km polar vortex cools the lower stratosphere over North America. Is not conducive to the formation of strong storms. Can anyone else visually get a rough 11-year cycle in that top graph? Just me? Clearly historical tornado data is wrong. Perhaps the old data needs to be adjusted for ‘homogeneity’ and ‘quality’…….down basically. The total tornado damage graph in 2014 dollars since the 1950s should be adjusted and put in per capita terms since more people, houses, and property damage in more recent times versus a half century ago; so even more extreme being weather history reality being less extreme and opposite of alarmists claims and scare forecasts. I am about to ask a stupid question. As I understand it, tornados are the result of cold air from the North-East meeting warm air from the Gulf. Given that the North East American continent has just had one of the coldest winters ever in the area that the cold northerly airflows come form. why are we not experiencing an extremely active tornado season? The irony is that in the future, when the present generation of hysterical doomsayers who run climate science are replaced by skeptics who admit how much they understand the climate and don’t just look for “scary things”, they may well point to the reduction in Tornadoes as one of the first signs that rising CO2 was having (as the history will be written the beneficial effect suggested by skeptics (no skeptics don’t actually say that!). At a very simple level, the reason is as follows: tornadoes are part of a heat engine system driven by escaping heat as hot air tries to get up above the dense ground layer to where it can lose heat through water condensation and IR emissions. In other words, they are the symptom of heat going from a hot to a cold zone. If however, CO2 reduces the rate of loss from the atmosphere, that cold zone will not lose heat quick enough to absorb the heat from the hot zone and the whole “heat engine” of the atmosphere will tend to decline and so storms like these tornadoes will tend to become rarer. However, a word of warning. Just as the “mickey mouse” explanation that “as things warm up there tends to be more violent [storms] has been proven to be a load of trollop, whilst the above explanation is based on a more sophisticated model of the atmosphere (one with wind) than the climate scientists predicting doomsday – it is still very simplistic and whilst it may appear “obvious” that storms will decreases – so many “obvious” things about the climate have since proven to be far from obvious. Circulation is important. Jetstream cuts off the very hot air subtropical. ‘but tornado damage losses are in decline’, this has been report as far back as 2007! AGW produces more wind sheer possibilities, which in turn tends to stop majors storms from forming, but if they do, they are more powerful! But the same IPCC has very high confidence in their predictions of a non-linear, chaotic system over the next 86 years with their faulty computer models. William: The warmists are continuing to look for any extreme weather events to push their agenda. The tornado outbreak in April 26, 1991 was not caused by global warming. F5-strength tornadoes are rare as specific rare atmospheric conditions are required for the F5 tornado to form. The term “suggestive” seems wise and appropriate. Yet it will not make headlines. And that is why, for the most part, this news will not make it out in the MSM (WSJ not withstanding). An excellent analysis with a lot of very useful information. Since the only states in which I’ve ever resided are the three at the top of the damage-per-unit-area list, I’m particularly sensitive to how bursty the data are. For example, I wonder where Massachusetts would have ranked if the data had begun in, say, 1955, rather than in 1953, the year of the tornado that tore up Worcester. I just attended a seminar at Ohio State University where the speaker, who works in a area related to global warming, asserted that extreme weather events were up. He had bought into some other lunatic ideas like ocean acidification, which he called the chief threat to fisheries, not overfishing. In the midwest of the USA, it has been a cold winter, and that leads into a cool late spring. I expect the tornado season will have a late start as well, along with my vegetable garden. Didn’t Dr Lindzen say that warming would actually produce less storm activity because of the equator to poles differential thingy? If i were an alarmist I would now start funding the good Doctor! Of course all the warmunists would have to delete their old posts about that smoking rubbish. Let me get this straight: allegedly climate change was responsible for our extremely cold winter and spring this year; the reason why we have had a very slow start to the tornado season is because of the cold, even though climate change is supposed to give us greater and very fierce tornados; therefore, climate change counteracted climate change; in other words, climate change shot itself in the foot this year. What a marvellous thing, this climate change. As a tornado chaser and anthropocgenic influence climate skeptic, the chart is meaningless. One tornado in downtown Amarillo , TX would wreak billions of $ in havoc. It’s just dumb luck that we don’t get tornadoes in cities… yet. A meaningful chart would be one of total tornado energy, as a product of intensity and count. Even then I don’t see how the climate effects. 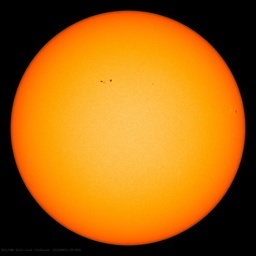 Since these are formed high in the troposphere, where we don’t measure “global warming”. The factors in tornado formation don’t depends on absolute factors, jut relative factors. But these to combine into one important measure at the surface: dewpoint. Everything else happens thousands of feet up. ok, im done being a pr! *k now. carry on. Do we know the reasons for this? On May 24, 1973, a violent tornado produced fatalities and extensive damage as it passed through the heart of the small farming community of Union City, Oklahoma, just west of Oklahoma City. The newly commissioned Doppler radar at NOAA’s National Severe Storms Laboratory observed this tornado,…….. This discovery led to dramatic improvements in accuracy and lead time in forecasting severe storms nationwide, and along with them, the ability to save lives and prevent serious storm-related injuries. We all know the problem is the conspiracy of tornado ‘deniers’… They just don’t believe hard enough in man-made tornado formation and we need a trillion dollar tornado tax to absolve our tornado guilt! Excuse me, but that report was in 2007! Which has appeared to come true, so be prepared to have a lot of hang overs! As more and more predictions turn into reality. Oops! “Appeared” there’s another drinking word. Let me make sure I have this right… Hurricane Sandy happened in spite of wind-sh and became the poster child for global warming Atlantic hurricanes. The magic heat changes the wind patterns so that the Atlantic has wind-sh but the Pacific doesn’t? And now you make me Kerry Emanuel? “Hurricane expert Kerry Emanuel, at MIT in the US, disagrees: “Sensitivity to shear may be overestimated,” he says of the study. Emanuel published a modelling study in October 2006 (Journal of Climate study, DOI: 10.1175/JCLI3908.1) suggesting a 10% increase in water temperature would increase hurricane intensity by 65%, whereas a 10% increase in shear would decreases hurricane intensity by only 12%.” Isn’t he claiming that there will be decrease in intensity but not in frequency? You’d turn us all into alcoholics! No ifs, maybes, buts,… or 4ths about it! It never ceases to amaze me how facile the AGW crowd is with their models. They make predictions for 2 decades that AGW will cause more and larger hurricanes. When that doesn’t happen, they realize they must acknowledge the hard facts so they gin up a new model that shows why AGW is causing fewer and smaller hurricanes! Simples!!! They make used car salesmen and patent medicine purveyors look like paragons of virtue, by comparison! I’ld like to start a drinking game everytime someone brings in the Sun. Replace Gia worship with odes to the Sun. And I’ve read some of them (gag me). Jump from one “burning stupid theory” to another. Now that’s an improvement…not. Gia, Gaia, Ghia, whatever the hell it’s called.